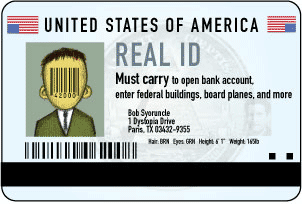 Chronicles of Dissent » Stop REAL ID! There are only a few days left to submit your comments to the Dept. of Homeland Security concerning REAL ID. No matter what Congress called it, it creates a national identification card system that, consistent with post-9/11 hysteria, would turn America into a “Your papers, please” society. Don’t just sit back and wait for others to do all the advocacy and fighting for you. Speak up, people, speak up! You can get more information here, here, and here. If you need ideas about what to write, see EFF’s sample letter or the sample on the Privacy Coalition‘s site. For news stories on Real ID, see PogoWasRight.org. Update 1: Over 50 organizations have now signed on to this campaign. Please join us!